Discussion in 'Larson Sawmill' started by cjmlarson, Jan 13, 2009. After getting a chance to run the Russell on different equipment out at the showgrounds (Rollag), we realized we wanted to keep working the engine as much as possible through the show (because it's just so darn much fun!). 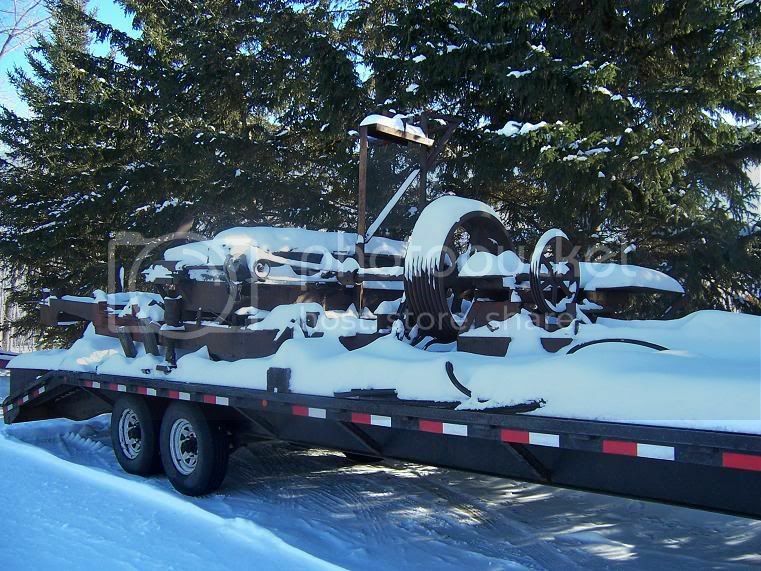 In my travels this winter, I found an old sawmill that I decided to purchase for this reason. The intent is to refurbish and put it back together as a portable mill. This way we can use it at home as well as bringing it out to the show in the fall. I'll post a couple of pictures to show you the start of our winter/spring/summer project. 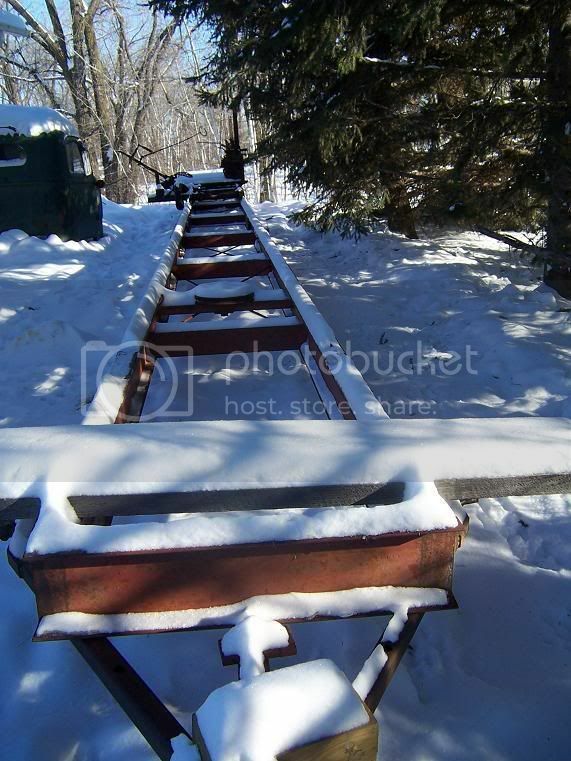 If you're not that familiar with sawmills, this picture shows a pile of iron with a big pulley. This is the husk and someone along the line, had started to make it into a portable. So I have about 2500 lbs of iron that needs the cutting torch and grinder to eliminate everything that's not needed. The snow is hiding alot of what needs to be removed. 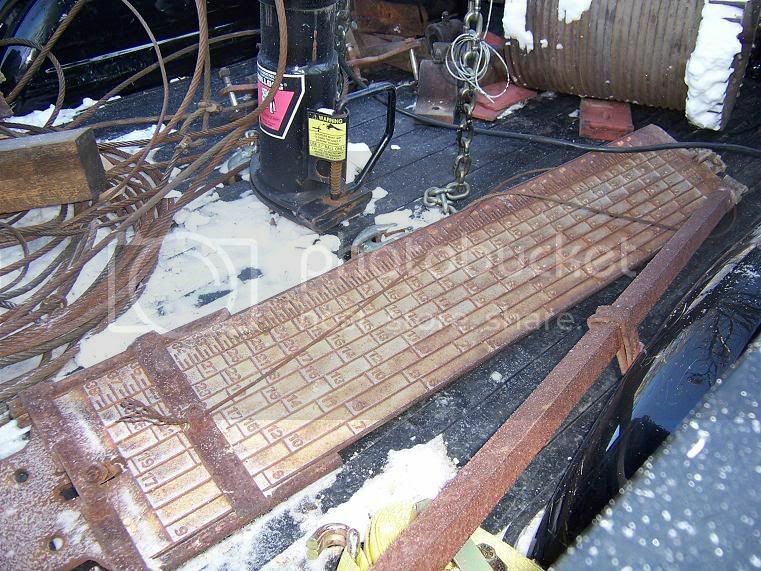 This shows the metal I-beams that replaced the original wood ones. This will make it much easier to make this into a portable mill. Mother Nature, as you can see, is not cooperating very well, with me being able to get anything done outside. Your new mill looks way too big for your maximum capacity! Congratulations on your newest project. Any news on the portable? Good one Tom! Never going to live that one down Clayton! The Sawmill looks like a fun project! If you think you need a little help, just be sure to have the right size pulley handy and I can think of an engine that could come to the rescue! I not sure I can find a pulley that small. I have to get Earls mill to hang something else up.I had an idea that this was going to bite me at a later date. 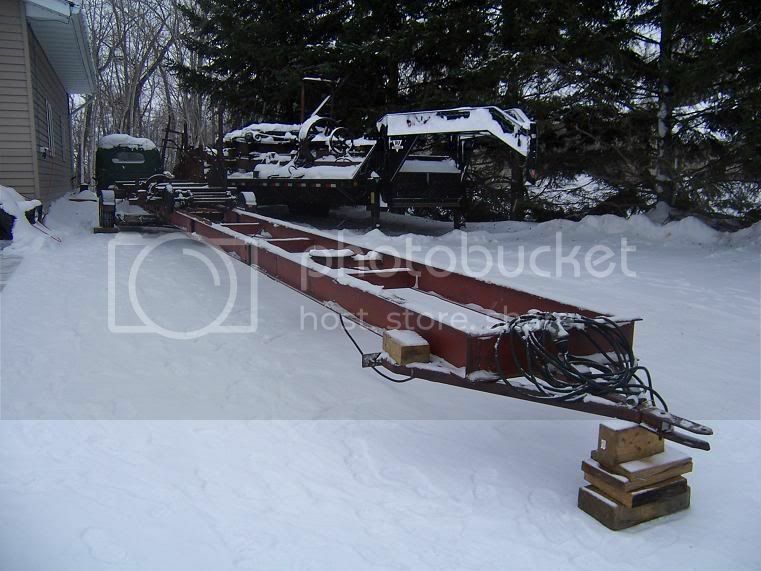 Thought I'd show you a really neat piece of equipment that came with this sawmill. Here is the sawyer's scale board. You can see there are many graduations for cutting different dimensions of lumber. Meaning, one column is in 1/4 graduations and it has many columns that go from 1" up to 2". After that, it's in 1/2" increments. This board has the ability to go up to 4" cants. I have been told that these are quite a neat accessory, and due to the fact that they are cast iron, they're usually missing or broken. 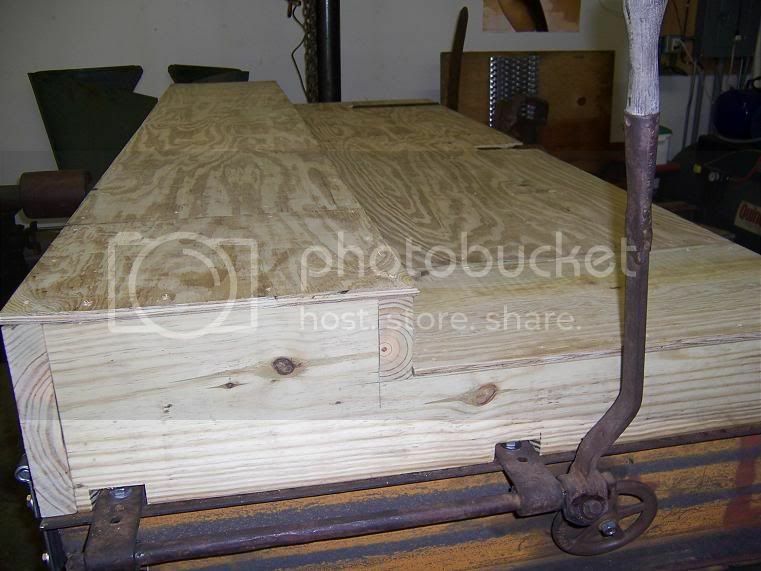 I needed a way to move the slab wood and cut lumber away from the husk, so I'm building a set of rolls. I am making this so that it will have the option to be either 'live' or I can just push the lumber along by hand. 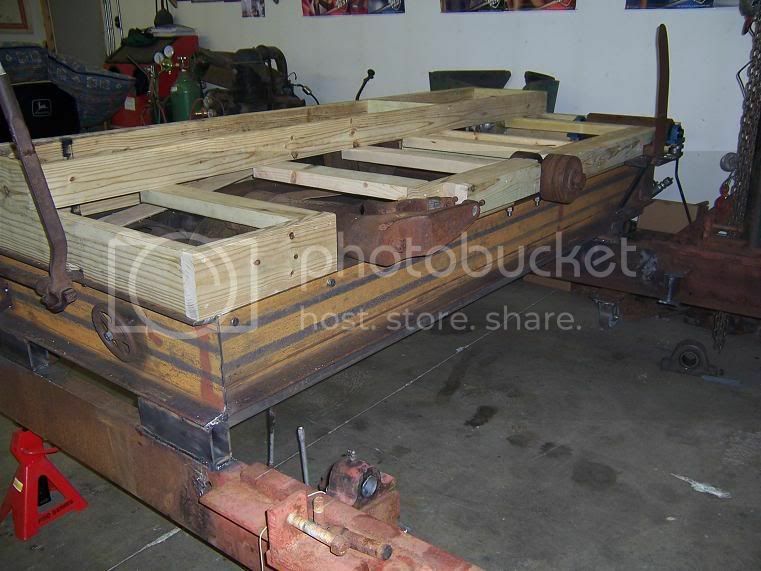 The following pictures show some of the progress being made this winter on rebuilding the husk frame and pulleys. 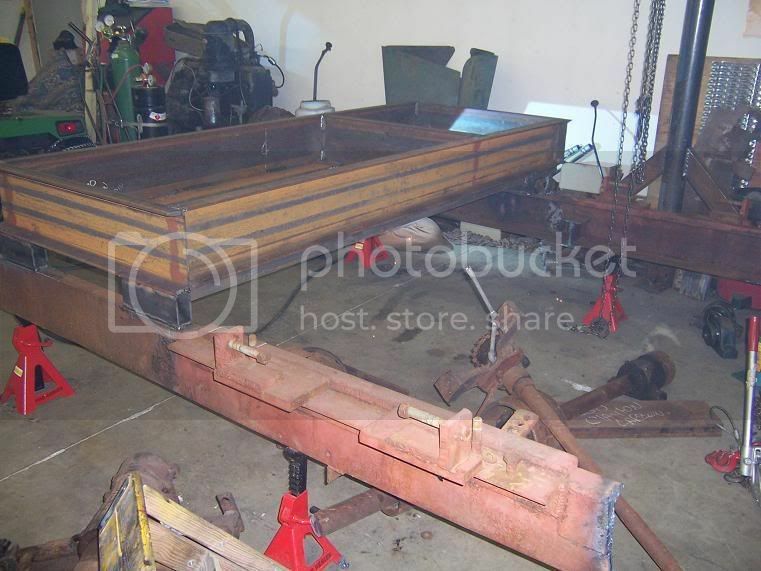 This picture shows the old husk frame with the pulleys and bearings removed. And you'll see the handy work of someone with a cutting torch. They tried to make slots to move the pillow block bearings for adjustments. The holes were gaping and not straight, and there were other things not shown in the picture, that justified rebuilding the husk frame. Next time I'll shovel more snow before purchasing, as to see all the little things that were wrong. 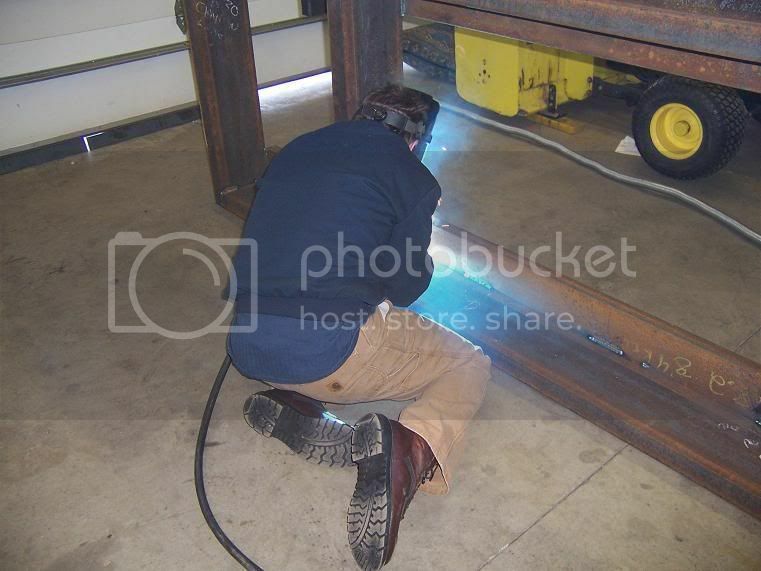 Here Mike is welding up the new husk frame. 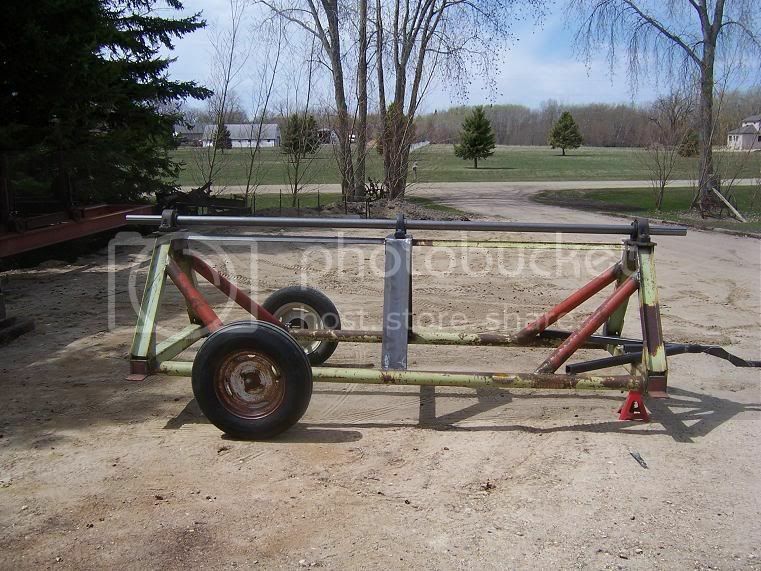 If you go back and look at the picture of the husk frame on top of the trailer, you'll see we've cut most of the unneeded iron off. 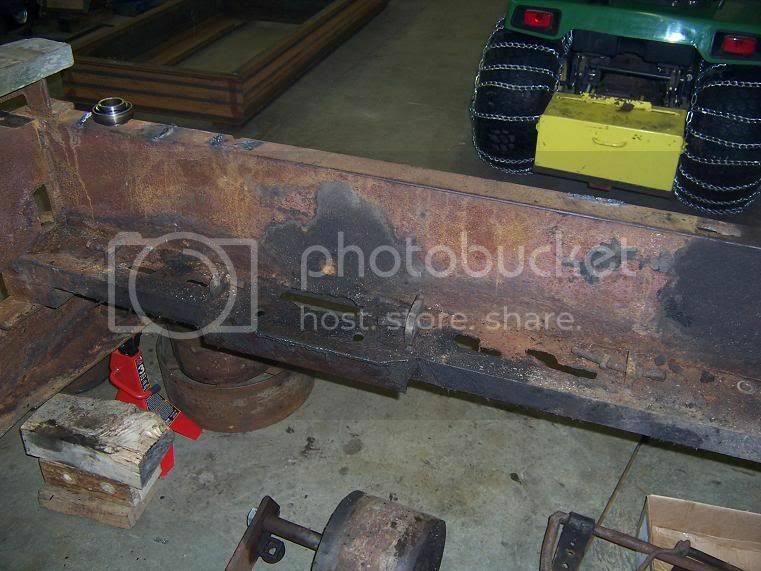 We have put the rebuilt frame onto the channel iron that will hold the carriage rails, squared it all up, and here Mike is welding it together. This is the friction drive pulley for reversing the carriage. Someone had installed 2 forklift steering tires on the hub. As you can see, they are almost wore out, plus the fact it's rubber, and I would assume that would make it jerky and grabby. There wasn't any way to get ahold of the hubs of the tires, so I took my sawzall and cut part of the rubber off, and then used my die grinder and cut the wheel hub, then I could press it off the shaft. Due to the fact that this is the carriage reverse pulley, there really isn't a need for it to be slipped much during operation. Friction paper is a tough commodity to come by, so I cut out masonite hardboard for the product to be used on this pulley. These pieces are 1/4" thick and I had to cut out 36 pieces to get my correct width. 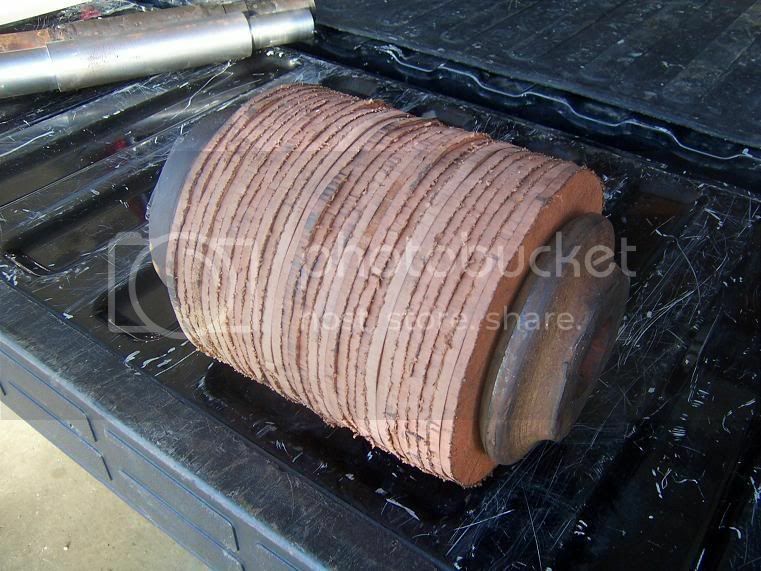 This is the carriage feed pulley that I used the correct friction paper material to rebuild it. This is due to the fact that this pulley gets slipped alot, depending upon how fast or slow you feed the log into the saw. I just didn't have enough to rebuild the reverse pulley with this same material. All I need to do is chuck this in a lathe and true up the surface of the friction paper so that it will be perfectly round. 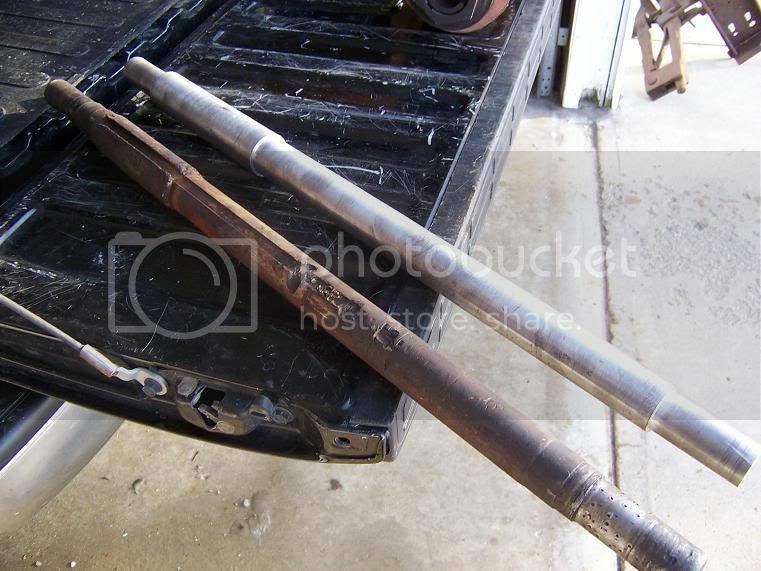 I had to make 2 new shafts because both of them looked similar to this for wear on the bearing surfaces and the keyways were worn also. In this picture, all I have left is to cut the keyways. After I got the shafts finished, I installed the friction drive pulleys on them and then turned them in the lathe to true up the surfaces to make them round. This is the carriage feed drive pulley. 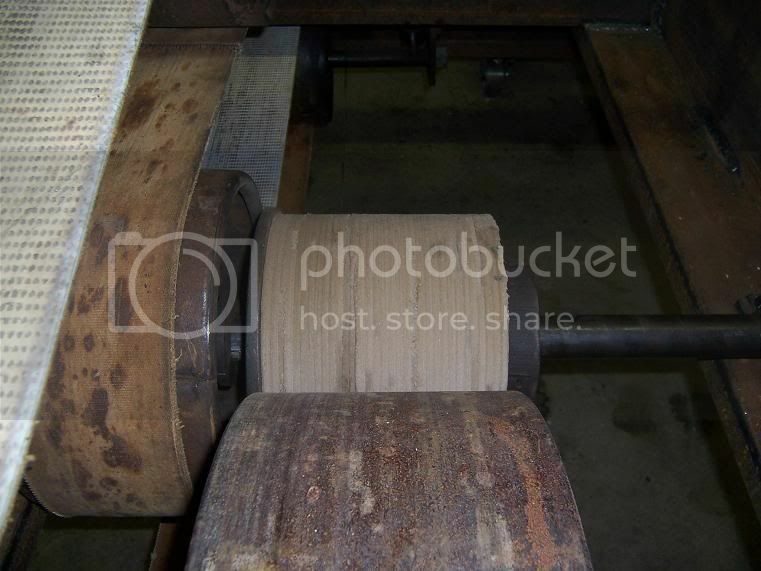 This picture shows the finished carriage return drive pulley. 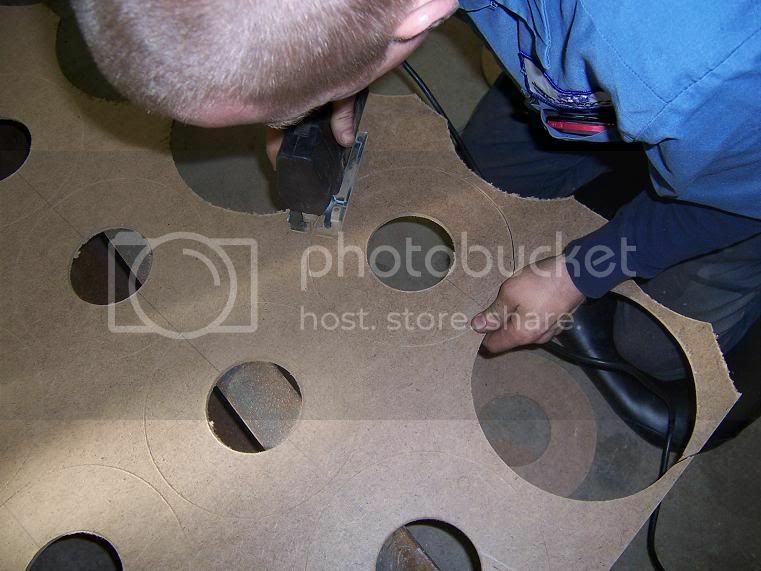 Here I am building new hanger brackets for the belt-tension idler for the drive system on the husk. I'd like to thank Roger Meyer for helping me finish machining the shafts and truing up the friction pulley surfaces. I did not get any pictures while I was at his shop, but I believe his boy Andy took a couple. Maybe he can find time to post those. 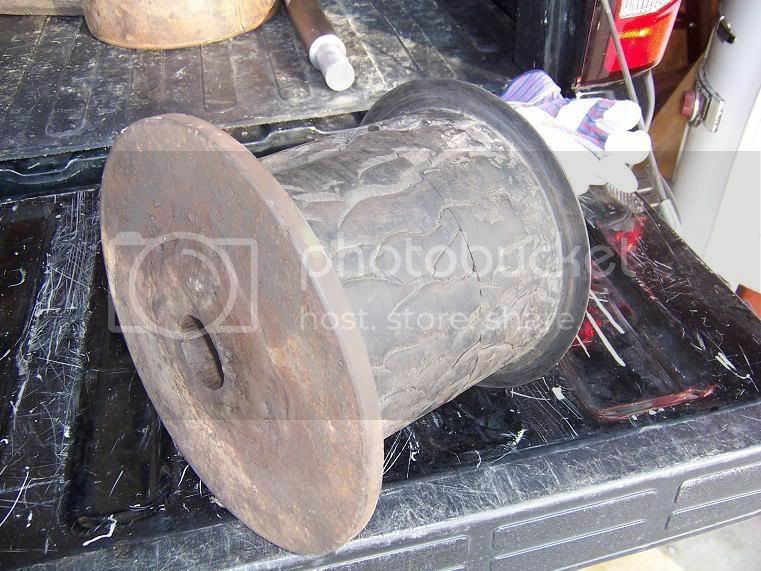 While I was there, we also narrowed up a cast-iron spoked pulley that I had found, which was 2 inches too wide. 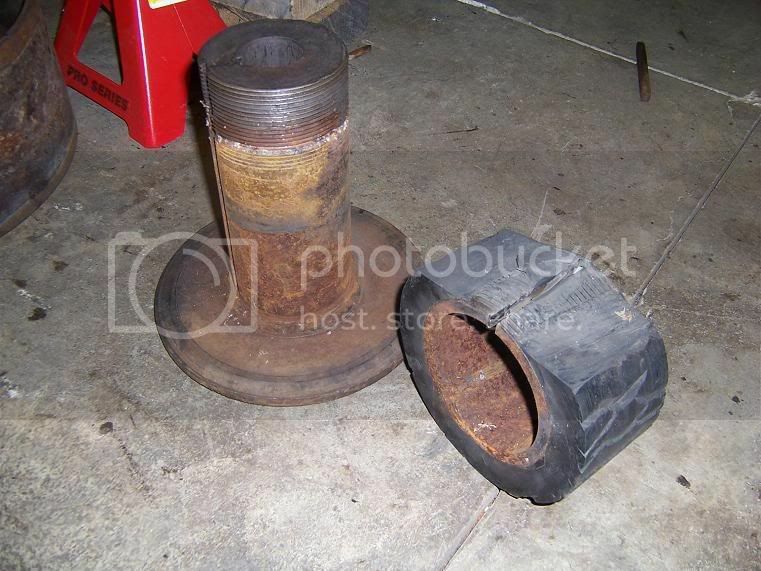 This was a pulley I had to replace because the one I had, had cracked spokes in it. 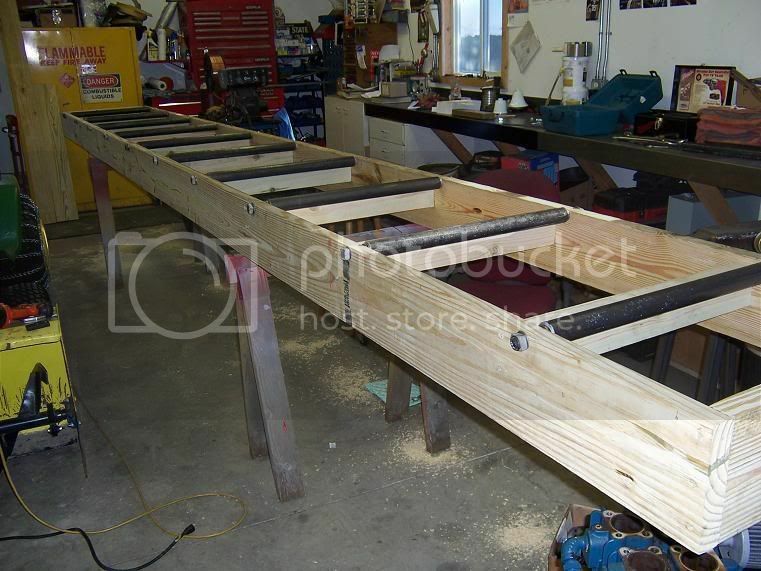 Things have been moving along quite well on the mill so here is some pictures of the platform that I have been building. As you can see I am making this so it hinges up so you can grease it and or if I would ever have to work on it. Here you can see the top of the finished platform. This shows the workings of the husk and also how the platform tips up out of the way. You can also see the drive for the roll in the back of the picture.That will be driven off of the arbor shaft with a belt. I will post some pictures later that have a better view of the drive system. Here's a better picture of the workings of the husk. You can see the bull wheel, which is driven by either the feed friction pulley or the return friction pulley. The bull wheel then has a sprocket on it's shaft that you cannot see, that drives a chain on the cross-shaft that runs the cable drum. 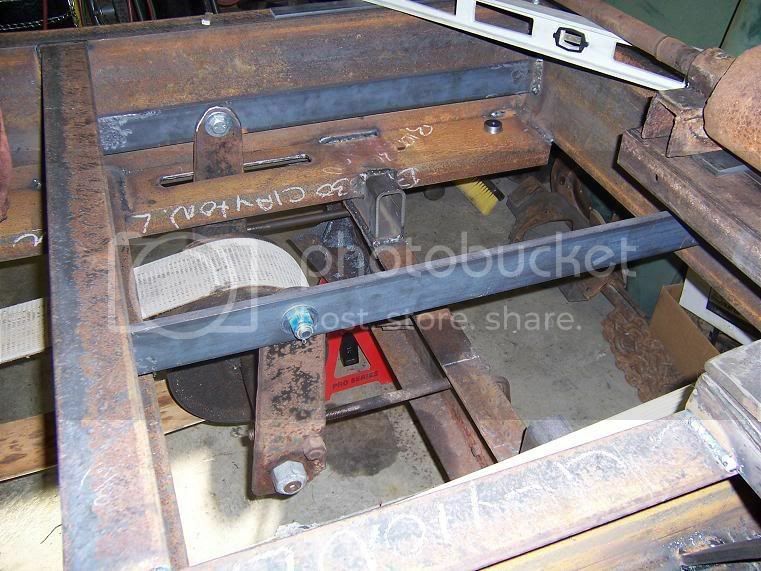 On this mill, I am not going to have a pulley on the arbor shaft and pull on that to tighten the belt. Instead I've decided to construct a portable drive so that when you back the engine in to tighten the belt, the belt tension will be pulling on the drive and not on the arbor shaft. The drive will have a driveshaft between it and the husk. 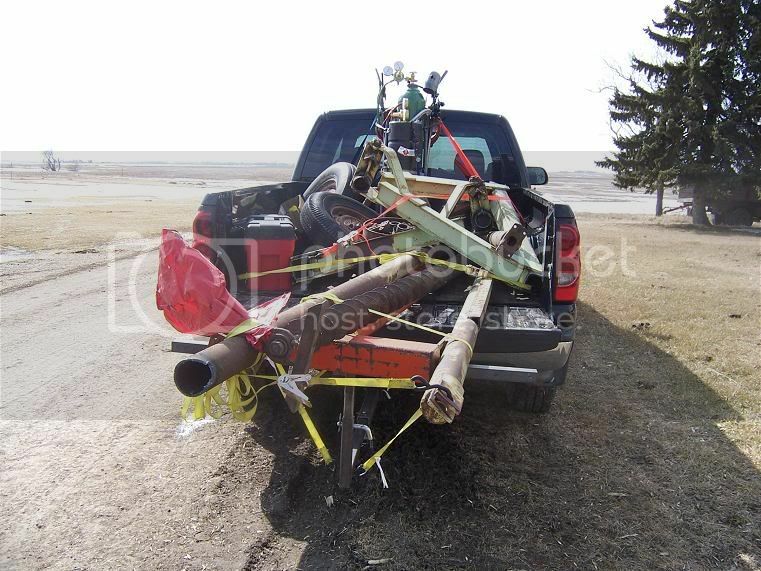 So Easter weekend, it was off to northern North Dakota to my Dad's scrap iron pile. 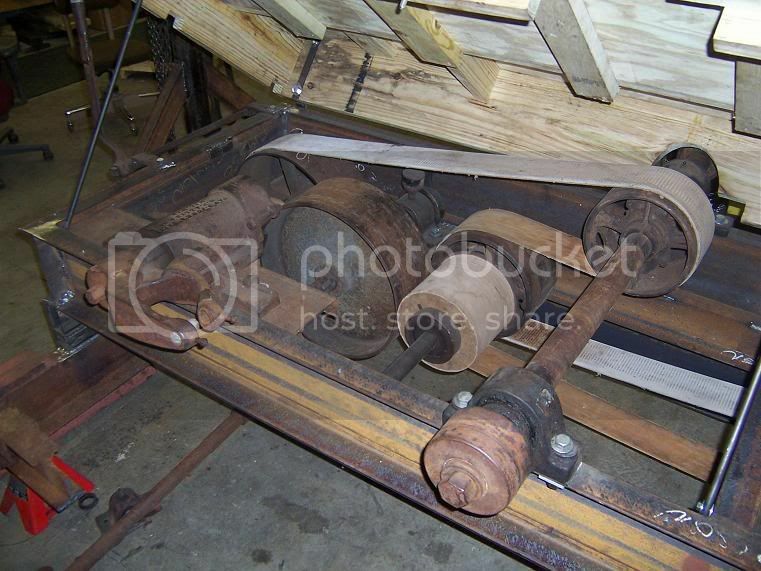 I needed lots of metal, a driveshaft out of an old truck, an auger for sawdust, spindles and wheels etc... Here's a picture of the load I brought back. The one implement he let me cut apart, actually turned out to have the majority of the iron I needed. Here you'll see the 2 A-frame pieces that will go on each end of the portable drive. 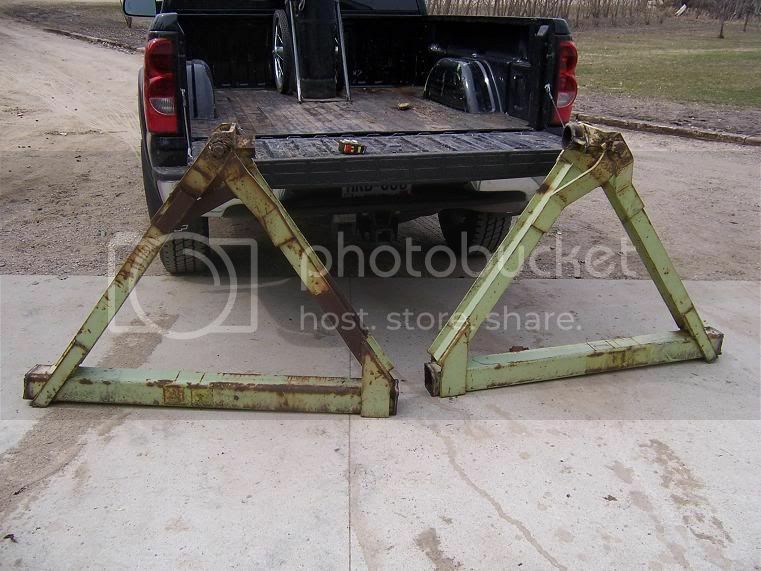 Obviously, there will be some fabricating to do on these 2 pieces. This is all I have time for now, but hope to post some more soon. Thanks for the update on the progress Clayton! Good to see that plans are progressing. It all looks great! You must be worried about the big Avery bending your arbor shaft backing into the belt? First off, thanks for the compliments Mark. But the real story is, I heard the Avery wanted it's turn on my mill, so I figured I better make a portable drive so that I can put another engine on to help the Avery get through the logs. I'm thinking the Russell would be a good one to help you out! This is the start of assembly of the main frame of the portable drive that I'm building. 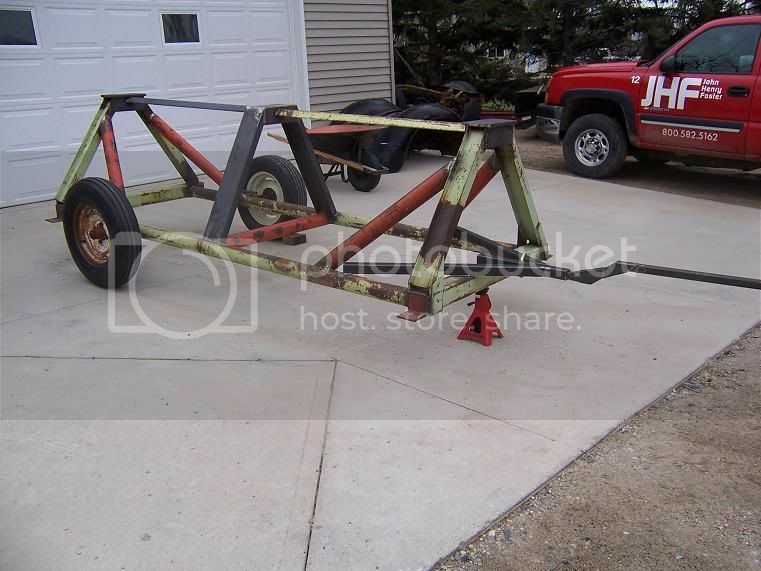 Eventually this will have a set of transport wheels and a hitch to pull it. I really like the colors. If I can add a couple more different ones to it, it should match every engine on the showgrounds. This is sure a neat project that you are working on. 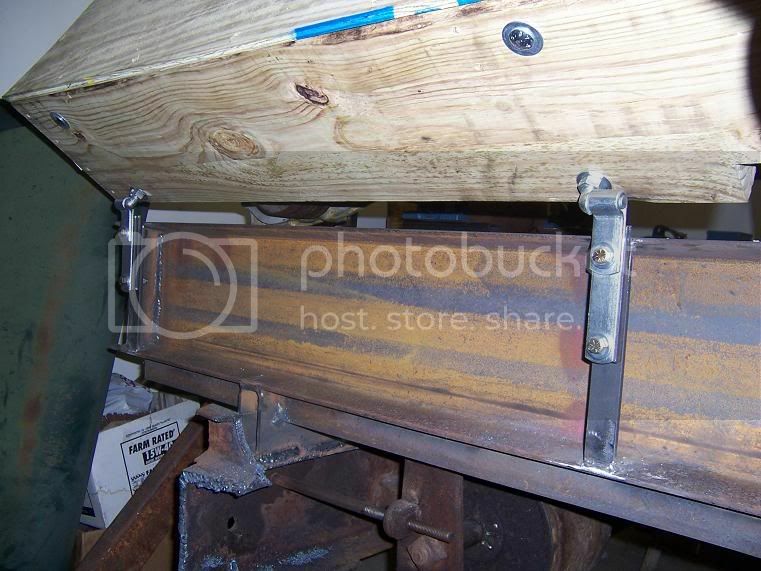 I'm also working on restoring a saw mill too. 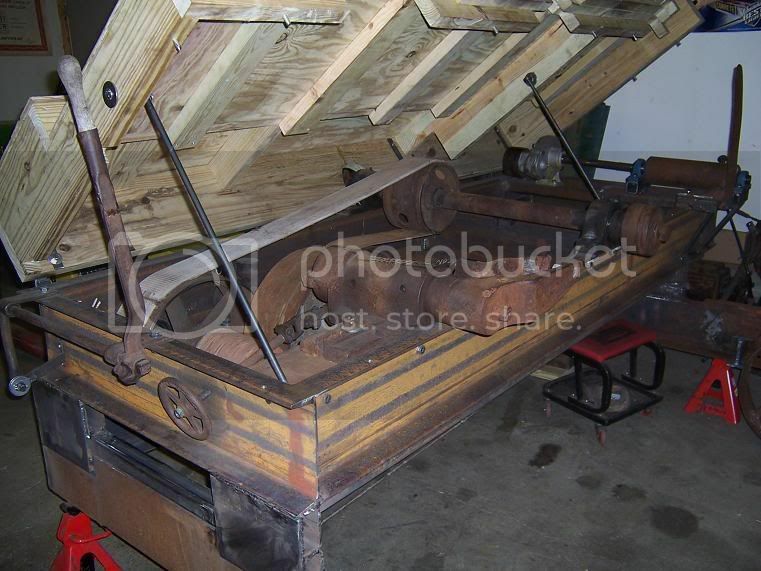 and if I could ask you some questions or keep in touch with you, as I go through the process of restoring my saw mill? And is there anyone else that knows of information about restoring saw mills. My saw mill is A.B. Farouhar co. LTD made in York PA. either post comments on here or feel free to email me at earl22070@yahoo.com. thanks. Here I have made the center bearing support and am also working on making the transport wheel mounts. 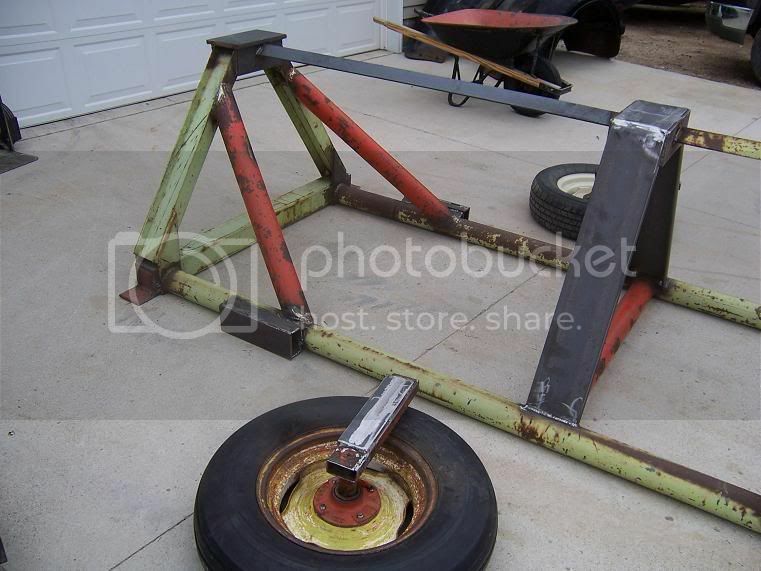 Gotta make it so it can make the trip to Rollag. Just a picture showing the drive with the transport wheels in place and now I'm working on the hitch. I have installed the bearings on the shaft and mounted it on the portable drive frame. 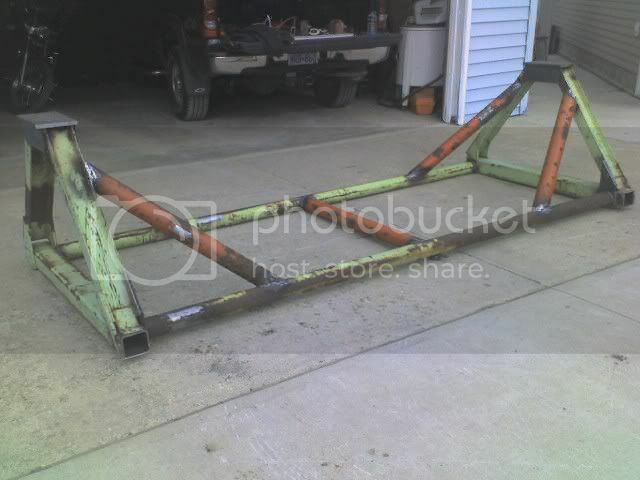 Not quite done with the hitch yet. I am getting hubs machined for the pulleys that will go on each end, and also I need to finish the hitch and maybe some paint. And then I think I will take it for a trial run down the road. Another fine project you got going Clayton and crew!! 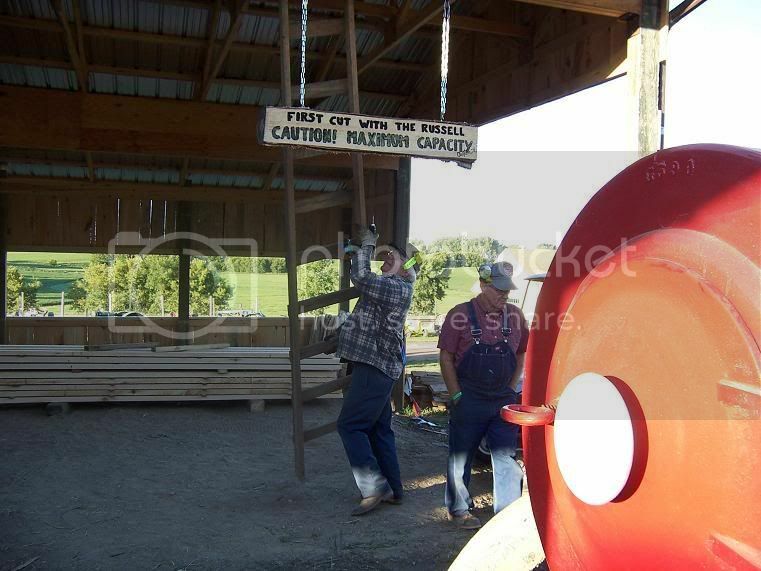 You should put on a additional pulley so that you can have an additional steamer on the mill. I was at a show in Ohio where they had 2 engines running the saw.. The sawyer had fun! Safety factor - probably wasn't one. 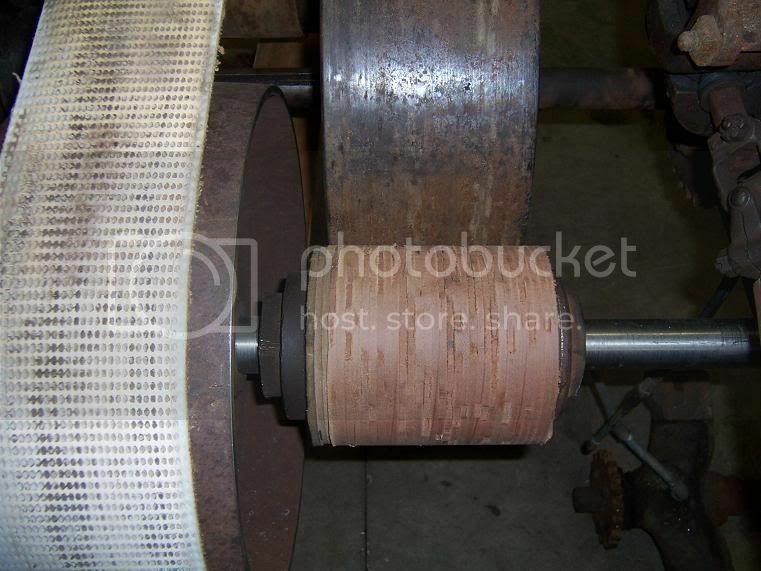 You should put on a additional pulley so that you can have an additional steamer on the mill. Brian, that's a good idea, but just so you know, that's the whole intention of making the portable drive. We're making it so when we get the 16 HP Portable done, we can run both engines on the mill. But in the meantime, there will still be 2 pulleys on there. We've already got a couple engines lined up that we can 'help' get through the logs we'll be sawing.